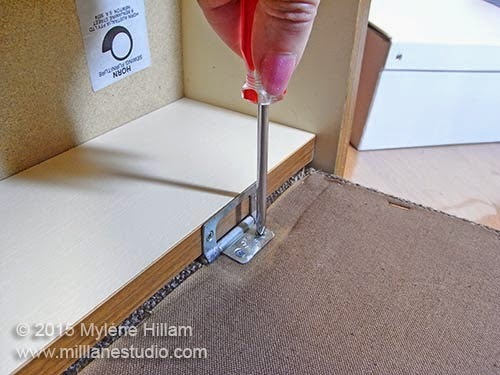 Many, many, MANY years ago, my husband gave me the most wonderful birthday gift - a Horn sewing cabinet with a built in machine lifter. To say I was over the moon would be an understatement. 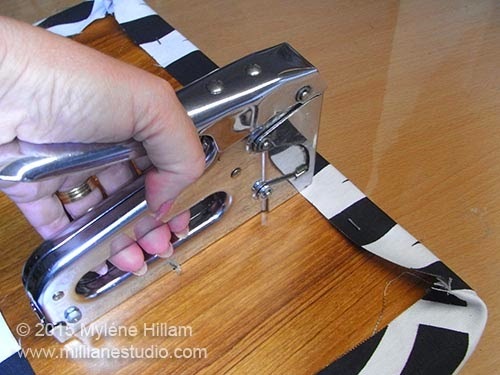 At the time, I was doing a lot of sewing for the little people in our lives so it was wonderful to have a space where I could not only sew, but I could also quickly and easily stow away my machine and sewing projects out of little hands way. Over the years, the cabinet fell into a state of disrepair and we parted company but the little stool which came with it continues to serve me well. Last week, I got a bee in my bonnet about that little stool. 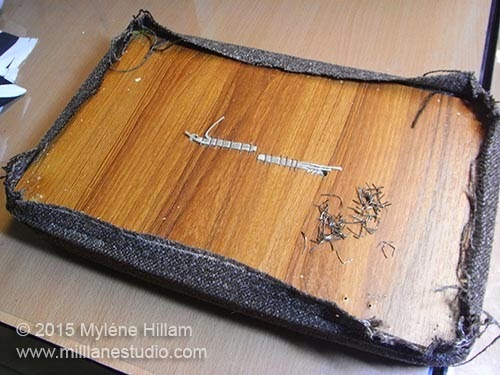 Whilst it's very compact and fits perfectly under my workdesk, visually, its 1980's brown laminate and brown fabric was sticking out like a sore thumb in my crisp black and white studio. It suddenly seemed very out of place! And whilst it's not in perfect condition, it's a very sturdy little stool that has a lift up lid with a storage compartment inside. It has a lot going for it..... just not the colour! So I thought this would be a piece worthy of updating. 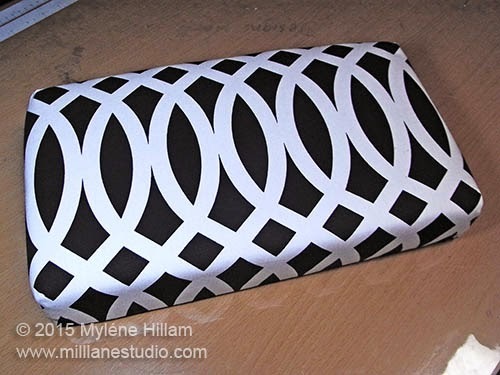 Firstly, I needed some black and white upholstery fabric which I got for the bargain price of $6/metre at Spotlight. Now I was ready to get underway. First thing to do was remove the cushion from the stool by removing the screws. I managed to undo most of them but had to enlist the help of my husband to get the last couple out. 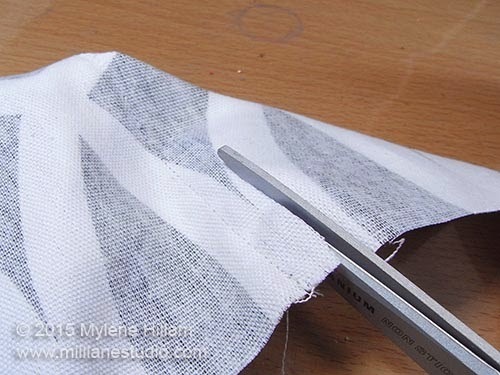 He stuck around for a bit and removed the staples from the fabric for me too. I really appreciated that extra muscle! There were dozens of them and some of them had snapped leaving part of them in the seat, so whatever could be pried out was pried out with pliers and those that couldn't be removed were hammered below the surface. Next came measuring the fabric. 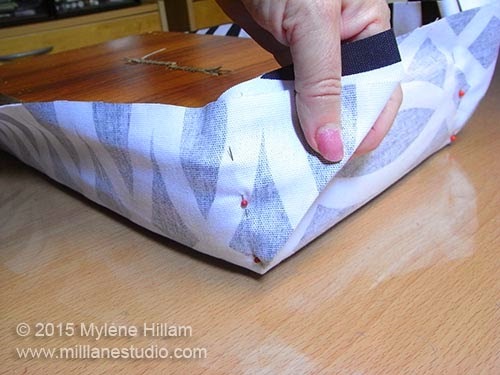 And the easiest way to do this was to simply lay the padded cushion on top of the fabric, making sure that the pattern was straight and that there was enough overhang to staple onto the seat. 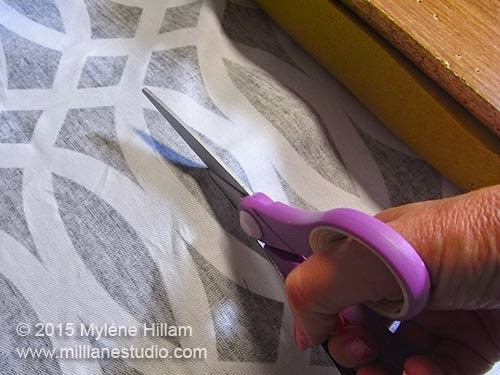 No need to mark cutting lines; the geometric pattern made it really easy to cut straight! 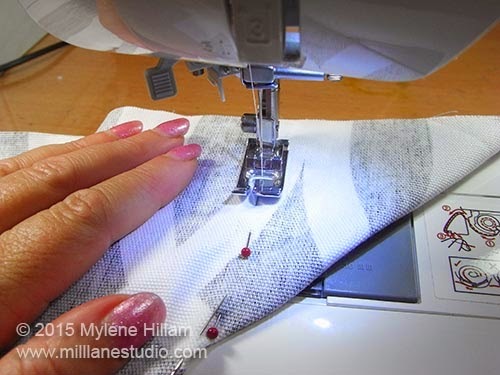 To work out where the seams should be, I turned the fabric right side up and centred the cushion on top. Then I was able to pin the corners to the shape of the cushion. ......before trimming away the excess. 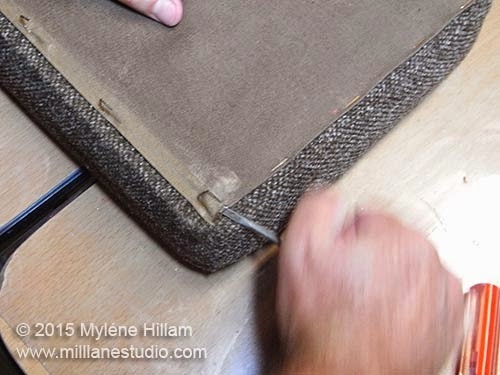 After turning it right side out and fitting it on to the cushion, it was time to staple it into place. 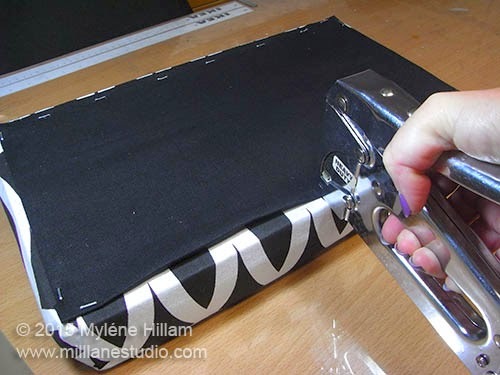 I also bought some black canvas to staple to the underneath of the cushion to hide the raw edges. Looking pretty good! The recovered seat is a great improvement. 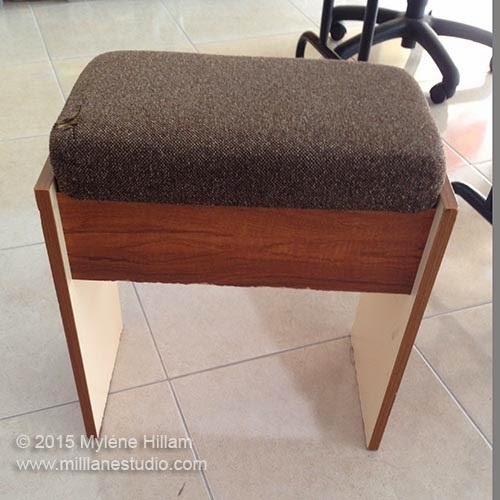 In my next post, I'll be revamping the laminate stool. You'll be amazed at the transformation, so please check back to see the finished piece!